The two-time defending 6A champion Derby Panthers will visit last year’s Class 5A state runners-up, the Goddard Lions, in a match-up that is much more meaningful than it was a year ago. Flash back to Week 2 of the 2016 season and Derby was still the defending Class 6A champion, but Goddard was still an unknown. Sure the Lions had just defeated Olathe Northwest 27-26 in two overtimes the week before, but this was a Goddard program that had finished 6-4 the year prior to total their most wins in a season in seven years. Of course, Goddard would go on to win 10 consecutive games last season and fall, literally, a couple of inches shy of a 5A state championship. But in that Week 2 game at Derby, the Lions drove down the field and took an early 6-0 lead before falling 35-6. The game was called final at halftime due to lightning and impending severe storms. Derby used a consistent ground game to beat the Lions last year, led by Brody Kooser’s 145 yards and two touchdowns. Last week, Kooser picked up right where he left off during the 2016 season by rushing for 123 yards and three scores in the Panthers’ win over Eisenhower. Derby will likely continue to use two quarterbacks this week in an attempt to eventually settle on a starter. Junior Hunter Igo passed for 117 yards and rushed for 41 yards in the opener, while sophomore Grant Adler threw for 78 yards and a touchdown and rushed for another score. Whichever quarterback is in the game, he’ll have Kooser in the backfield and Michael Littleton as a big-play target. Goddard, on the other hand, is settled at quarterback. Blake Sullivan returns for his senior season after passing for more than 1,600 yards and rushing for 1,400 more in 2016. He accounted for 46 total touchdowns last season. Kody Gonzalez, Sullivan’s all-state backfield mate last fall, graduated after rushing for 1,860 yards and 18 scores. Wichita North transfer Darius Russell has replaced Gonzalez in the Lion backfield. Goddard opened with a 49-20 road-win at Olathe Northwest last week. Sullivan was again the catalyst; passing for 168 yards and three touchdowns and rushing for 132 yards and two more scores. Russell debuted with an 88-yard effort and scored a touchdown. 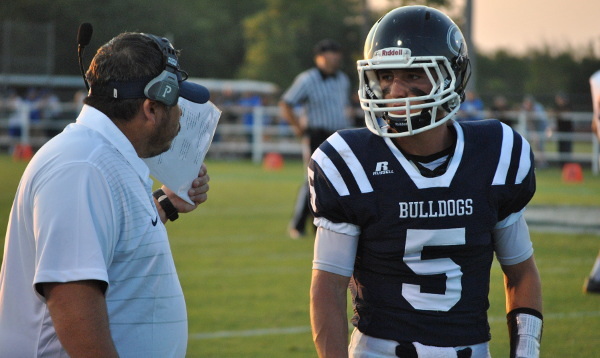 Goddard returns three starters up-front from a season ago, including all-state selection A.J. Vang. The Lions will have more experience up front than Derby, but in the end the Panthers and their 24-game winning streak may be too much. Two of the top teams in state will do battle this week when the St. Thomas Aquinas Saints make the short trip to face the Blue Valley North Mustangs in an Eastern Kansas League contest. Class 5A’s top-ranked Saints, who advanced to the state semifinals last year, opened the 2017 season with a convincing 35-14 win over Gardner-Edgerton. Aquinas led 28-0 at halftime. Senior quarterback Will Swanson was extremely efficient for the Saints, completing 6 of 8 passes for 200 yards and two touchdowns with no interceptions. Swanson added 40 yards on the ground with only seven carries. Junior Cameron Jackson led the Aquinas rushing attack with 100 yards on 11 carries. The receivers were led by senior Jack Morrissey with four catches for 151 yards. Joe Clune, an All-State selection as a blocking tight end last year, caught one pass for 30 yards. The Saints’ offensive line is led by junior Joe Michalski, who earned All-State honors last year. Coach Randy Dreiling has led Aquinas to a 27-11 record since he took over the program in 2014. The Saints were 3-7 the season before Dreiling took over. Class 6A’s third-ranked Mustangs dropped Blue Valley Northwest 48-13 in the season opener. Making his first start for Blue Valley North since transferring from Bishop Miege, quarterback Graham Mertz completed 24 of 36 passes for 276 yards and six touchdowns. Mertz’s potential was well known despite being a backup for the Stags. KU already offered Mertz a scholarship before the start of this season. Mustangs running back Grant Hamel caught four of the TD passes. Hamel finished the 2016 season with 1,466 all-purpose yards and 16 touchdowns. Blue Valley North is 18-13 since Andy Sims took over as head coach in 2014. The Mustangs were 1-26 the previous three seasons. Aquinas won last year’s matchup between the two teams by the score of 35-14. The Saints are on a 15-game winning streak over the Mustangs. McPherson earned a big win, 33-21, against Buhler, previously ranked second in Class 4A, Division I. The Bullpups jumped out to a 19-0 lead and held on after Buhler closed to within 19-14. The Bullpups and Crusaders have now split the last six meetings. Meanwhile, Maize South rolled over Towanda-Circle last week, 47-0. Last year, Maize South defeated McPherson twice, 14-6 in Week 2, and 35-27 in the playoffs. Both games were played in McPherson. The Mavericks finished 10-2 last season with an average score of 38-15, while McPherson was 8-3 with an average score of 31-12. Maize South returns six offensive and seven defensive starters for ninth-year coach Brent Pfeifer, the only coach in program history. Both of the Mavericks’ losses a season ago came to Buhler. Plenty of Maize South’s experience comes from the secondary with seniors Jack Wagner, Tyler White and Tristan Knoblauch (two interceptions in Week 1). Max Dominic rushed for a pair of scores last week. McPherson had to replace several talented skill players, most notably quarterback Casen Hoover. Kyler Hoppes stepped in and played well. He passed for a six-yard score for the Bullpups’ first points and rushed in the second. In the final seconds of the first half, Hoppes found Tayln Huff on a short screen pass that produced a 50-yard score. Once Buhler closed to within 19-14, McPherson’s defense held the Crusaders on 4th-and-goal from the 1-yard line. The Bullpups followed with a 94-yard pass inside the Buhler 5-yard line. Later, McPherson had another big play with a 59-yard punt return for a score by Gabe Hoover. Hoppes finished 11 of 18 for 260 yards with three scores and two interceptions. This is likely going to be a low-scoring game. McPherson has enough firepower to hit on several big plays, similar to Week 1. Scott City has long dominated this rivalry before Holcomb won two contests last season. Scott City had won 12 of the last 13 meetings, including a 15-7 victory in ’15 when Holcomb eventually won the 4A-II title. Last year, Holcomb won 32-6 in the regular season and 34-20 in the 4A-II playoffs. These teams were virtually identical in the major statistics last year. The Beavers had an average score of 38-13, while Holcomb delivered an average margin of 37-14. Holcomb finished 10-2 with a pair of losses to eventual champion Pratt. Scott City finished 7-3, its first season with fewer than double-digit wins since ’07. Holcomb held off Cimarron, 15-12 last week. Andrew Morss delivered a highlight reel 23-yard catch that helped on the eventual game-winning 80-yard drive. Chance Rodriguez caught the final TD from Trey Gilbert, and then recovered a key fumble. Holcomb permitted 183 yards to Cimarron running back Josh Seabolt, but had over 100 passing yards more than the Bluejays. Gilbert, in his second year as the starter, completed 8 of 18 yards for 133 yards with no scores and no interceptions. Gilbert and senior Kaden Tichenor completed for 34 carries for 136 yards, while Morss, Rodriguez and Caeden Spencer form a senior trio of wide receivers. Scott City lost to Hays High last season but controlled the game in a 29-8 road win versus the Indians last week. Scott City returned six offensive and seven defensive starters, including senior halfback Jarret Jurgens and junior running back Wyatt Hayes. Scott City had a 16-play drive that included the first play of the second quarter and yielded a 26-yard field goal. The Beavers bumped the advantage to 9-0 with a TD on its next possession. Hays High picked off a Scott City pass, but the Beavers responded with a pick-six for a 16-0 lead. The Beavers held a 271-97 yardage edge. Sophomore Parker Gooden took over for two-year starter Bo Hess under center. Hayes finished with 19 carries for 105 yards. These teams know each other very well. Holcomb gets the edge in the passing game and earns the victory. Class 4A Division II’s Frontenac Raiders will travel to face 3A’s Galena Bulldogs in a traditional Crawford-Neosho-Cherokee League matchup. Both teams are among the others considered in their respective classes. Frontenac opened the season with a 33-6 win over the Girard Trojans. The game was tied at 6 before Frontenac scored the game’s final 27 points. The Raiders broke the tie before the half when Peyton Brown connected with Jake Wilbert on a 40-yard touchdown pass. Coach Mark Smith has led the Raiders to a 39-15 record since taking over the program in 2012. The Bulldogs opened the season with a 16-0 win over St. Mary’s-Colgan. The defense led the way with the shutout, but Galena’s offense gained 313 yards. Joseph Helton led the way with 156 rushing yards on 23 carries. Quarterback J.C. Shelton completed 6 of 12 passes for 108 yards. Garrett Hall caught all six passes. Entering his 11th season as head coach, Beau Sarwinski has led Galena to a 79-31 record. Frontenac won last year’s meeting 35-14. The Raiders are on a three-game winning streak over the Bulldogs. The longtime Mid-Continent League rivals match up as top-three teams in their respective classifications. Smith Center has won seven straight home contests and 20 of its last 22 at home with both losses coming to Phillipsburg in 2015. That season, the Redmen fell late in the fourth quarter to Phillipsburg in Week 9, and then Phillipsburg pulled away in the second half in the 2-1A state championship game en route to the state title. Smith Center started this season with a 16-7 home conference win versus Plainville. Phillipsburg, which opened with a 54-8 road win versus Clay Center, has captured 13 straight regular season wins. The Panthers went 6-0 in MCL play last season and 4-1 in 2015, a three-way tie for the league title between Smith Center, Phillipsburg and Norton. Phillipsburg has won six in a row versus the Redmen with scores of 28-6, 43-18, 50-7, 14-7, 40-6 and 29-16 last season. Smith Center struggled with turnovers and penalties but had a dominant defensive effort against Plainville. Senior running back Jesse Staples, who averaged more than 10 yards a carry in limited action last year, finished with 19 carries for 127 yards and two scores. Senior lineman Dalton Kuhn had with three TFLs with an intentional grounding in the end zone for a safety. Senior quarterback Colton Hutchinson completed 2 of 5 passes for 50 yards. The Panthers led 41-0 at halftime versus Clay Center. Phillipsburg has a bevy of returning talent with 10 offensive and nine defensive starters, including junior quarterback Trey Sides, running backs Kirk Coomes and John Gower and a line paced by senior Chris VanKooten. Phillipsburg has generally won this contest with outscoring the Redmen in the second half, especially in the two meetings in ’15. Last year, the Panthers built a two-score lead late in the third quarter. Smith Center closed to 22-16 late in the third before Phillipsburg scored again for the final margin. Both of these teams are the favorite on the western half of the state of their respective classes. Last year, Staples had two carries for 14 yards, while Hutchinson went 7 of 12 for 112 yards with no scores against two interceptions. Smith Center likely needs big plays – and few turnovers - to beat Phillipsburg’s size and depth. Staples and the Hutchinson to Brett Meyer connection is likely key for the Redmen to gain yardage in chunks. However, the Panthers’ depth and all-around talent is again enough for the victory. Sharon Springs-Wallace Co. (0-1) at Atwood-Rawlins Co. (1-0) – Rawlins Co.
Derby, Goddard, Goddard-Eisenhower, Olathe Northwest, Wichita North, St. Thomas Aquinas, Blue Valley North, Gardner-Edgerton, Blue Valley Northwest, Bishop Miege, McPherson, Maize South, Buhler, Towanda-Circle, Holcomb, Scott City, Cimarron, Hays, Frontenac, Galena, Girard, St. Marys Colgan, Phillipsburg, Smith Center, Plainville, Clay Center, Norton, Junction City, Topeka High, Wichita Heights, Wichita Northwest, Washburn Rural, Manhattan, Andover, Kapaun Mt. Carmel, Blue Valley Southwest, St. James Academy, Bonner Springs, De Soto, Emporia, Topeka Hayden, Andale, Labette County, Abilene, Marysville, Hoisington, Wichita Collegiate, Sabetha, Holton, Halstead, Hesston, Olpe, Caney Valley, Argonia-Attica, Caldwell, Logan-Palco, Northern Valley, Macksville, Victoria, Sharon Springs-Wallace Co., Atwood-Rawlins Co.